A file of research on Louis Chevrolet, the leader of the Chevrolet brothers, which included Arthur and Gaston, who won the 1920 Indianapolis 500. Chevrolet was an excellent driver, mechanic and engineer. He struggled with his business dealings, losing his interest in the Chevrolet Motor Company, which eventually became part of GM. Several other efforts went south as well and he was reduced to humble means by the time of his death in 1941. This hodgepodge of clips comes from Barney Oldfield's personal scrapbook, but the feature content has little to do with him. 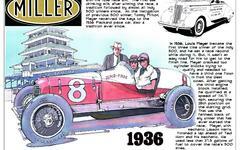 The main article is about a race that took place in the autumn of 1909 at a two mile road course near Atlanta. Louis Chevrolet won that race handily, his only setback being an oil fire under the hood of his Buick, which he quickly extinguished. There is another article covering the events of the Indianapolis Motor Speedway's little known speed trial in December 1909. This event was to test (and promote) the newly paved track that was quickly nicknamed the Brickyard. A sample of obituaries covering Louis Chevrolet's death on June 6, 1941. The Charleston (West Virginia) Gazette on June 7, 1941 article of Chevrolet's passing was page one news, appearing below the fold with a jump to page two in column four. Louis Chevrolet's son, Charles, died at 29 years of age on May 30, 1934. This was a terrible blow to his already ailing father. This is a collection of articles that provide good background on Louis Chevrolet at various points in his career. A collection of articles documenting Louis and Arthur Chevrolet's Frontenac automobile business. Check out excellent information about this sad business story. Late in life, Louis Chevrolet tried to trade on his name. Teaming with Sunoco and the AAA, he participated in a promotional test to demonstrate the effectiveness of a new Sunoco Oil product. These are ads promoting that product. The tests were first ran in 1934. The significance of this article is that Louis Chevrolet entered the 1914 Los Angeles-to-Phoenix "Cactus Derby" in his return to auto racing as a driver for the first time after starting the Chevrolet Motor Company with William Durant in 1910. Chevrolet and Durant had a fabled falling out, but what is interesting with the 1914 Cactus Derby is that Louis came back to racing driving a Chevrolet - owned by his race driving teammate, Cliff Durant. Cliff was the son of William. Only check out this article if you are a serious researcher investigating Louis Chevrolet. The quality is poor, and the article is incomplete. It has data points about Chevrolet's early career - such as the time he spent at a winery and later at Mors. Otherwise, don't waste your time. This article is an interesting point of view from the perspective of a self-admitted novice to motor racing who took a ride with one of the bravest men ever to grip a steering wheel, Louis Chevrolet.